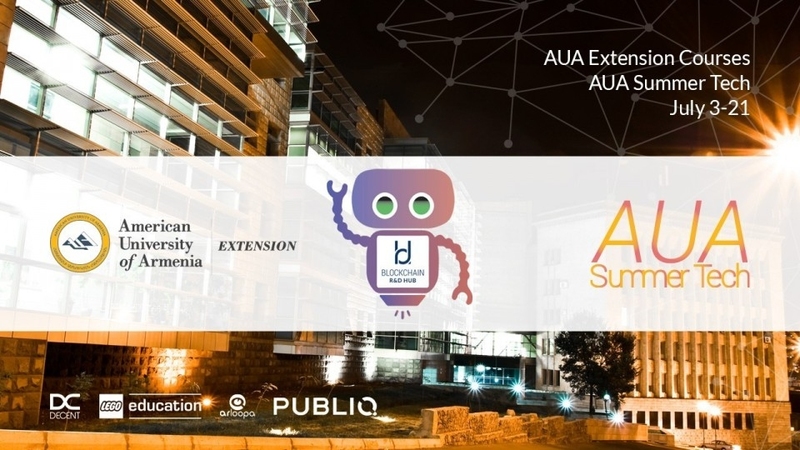 The Blockchain R&D Hub is glad to announce its participation in the first Summer Tech course training session at the American University of Armenia in July 2017. As digital disruption continues to grow at a rapid pace, students are faced with new challenges and choices within this digital age. The blockchain course is an initiative designed to educate young generations in the area of new disruptive technologies. Blockchain R&D Hub is happy to teach blockchain. The emerging startup will dedicate a course to its participants, explaining what the blockchain technology that underpins bitcoin, as well as an increasing number of ecosystems, is all about. The course is available and will take three weeks to complete at a rate of 5 hours of work a day. The program helps young students get to grips with blockchain as well as other emerging technologies like augmented reality, virtual reality and robotics. PUBLIQ and DECENT, partner with Blockchain R&D Hub will also participate in the program. Come and join us from the 3rd to the 21st of July to explore some of the most disruptive technologies! For more information and enrollment, please feel free to visit AUA Extension website.